How does Clark Kent get away with wearing nothing but a set of dorky black rimmed glasses to hide his secret identity? If that really worked, getting through airport security would take double the amount of time. And what happens if he rolls out of bed after a late night of fighting super villains and forgets to put them on? No, sir. Not for us. We think you should protect your identity the smart way, the way Batman does it. He wears a full mask, making sure that no bad guy can get a clean look at his face. The last thing Bruce Wayne needs is for nefarious characters like the Joker and the Penguin knowing where to find him when he's off the clock. If you plan on doing some superhero deeds, then you should probably follow his example! 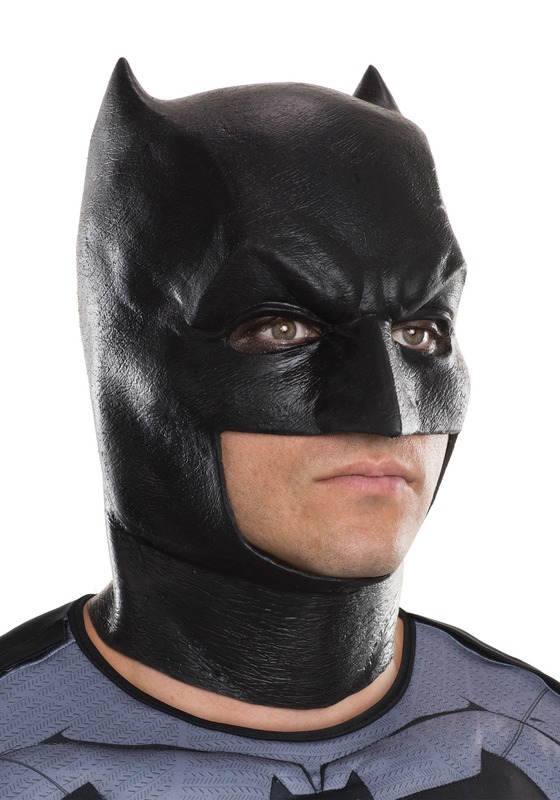 This Dawn of Justice Full Batman Masks helps you assume the role of Gotham's greatest hero, while also protecting your secret identity from any would-be super villains in your area. It's based on the mask worn by Ben Affleck in the Zack Snyder movie, Batman v Superman, so you can also use it if you're trying to do a killer Bat-fleck impersonation. Pair it up with one of our costumes, or just wear it with a black t-shirt and you'll probably feel tough and gritty enough to duel Superman. Just make sure you get your hands on some Kryptonite before you slip on this mask to go start beef with Supes!